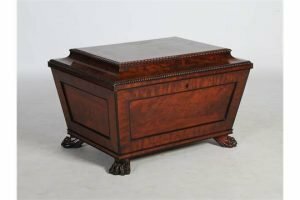 A 19th century mahogany and ebony lined sarcophagus shaped cellarette, the hinged top with gadroon and bead carved detail, above panelled sides, raised on four paw feet. 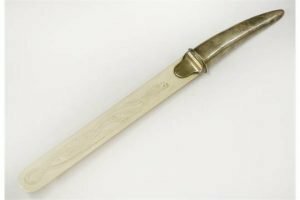 A Victorian ivory letter opener, with silver handle, Birmingham, 1901, the blade carved with an eagle-headed lizard. 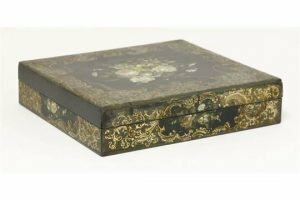 A Jennens & Bettridge black lacquered box and cover, 19th century, containing five lidded boxes and covers, all painted with a bouquet of flowers, within a gilt border. 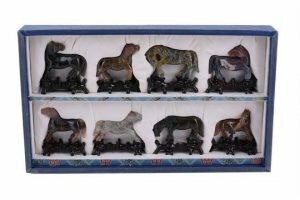 A Carved Hardstone Set of the Eight Horses of Mu Wang, 20th century, each animal worked in a different stone and standing on a fitted wood stand; the set contained within a fitted storage and display box. 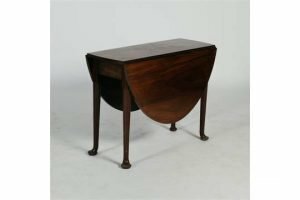 A Victorian mahogany Sutherland table, on columnar under frame with stretcher. 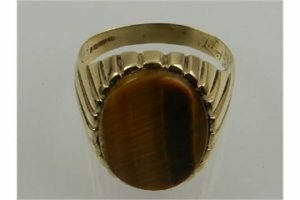 A 9 carat yellow gold and tigers eye gents ring, the oval cut tigers eye within a tapered shank. 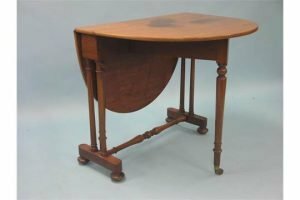 A George III laburnum drop leaf table, the oval top with twin drop leaves, raised on tapered cylindrical supports terminating in pad feet. 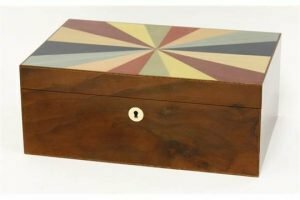 A contemporary jewellery box by Penhaligon’s, London, the hinged top inlaid with a sunburst of sixteen stained wood panels, with a plush interior. 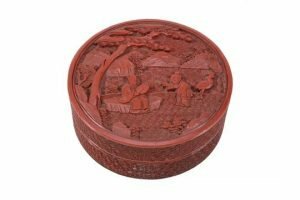 A Chinese cinnabar lacquer circular box and cover, Qing Dynasty, carved with a sage under a pine tree, an attendant before and with a stork to one side. 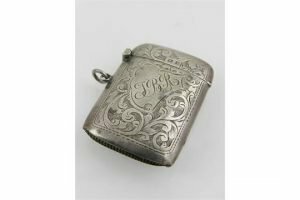 A silver vesta case, engraved with scrolling foliage and letters J.B.R, hinged top, hallmarked Rolason Brothers Birmingham 1914. 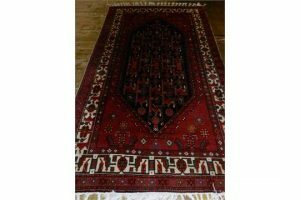 A red ground Persian carpet, having large medallion to centre, on a stylised floral ground, multi-bordered and fringed. 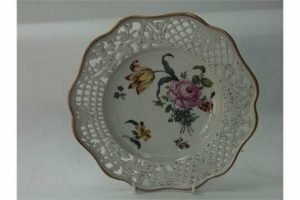 A 19th century continental dessert plate in the Meissen manner, with painted floral sprigs and sprays within pierced floral and lattice work border, with blue cross swords mark to reverse. 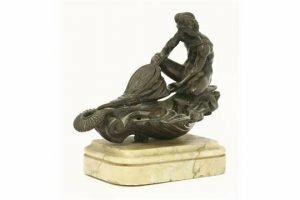 A Grand Tour bronze figural oil lamp, in the form of a god pumping bellows, on a Siena marble base. 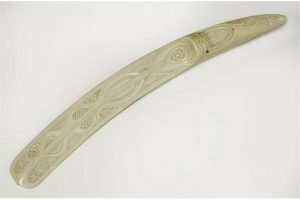 A Victorian ivory letter opener, profusely carved to one side with Native-American styled fan-shaped panels. 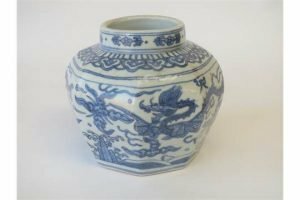 A Chinese blue and white octagonal ovoid ginger jar decorated with dragons, six character mark to base. 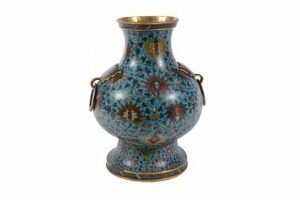 A Chinese cloisonné enamel vase, in Ming style, the globular body with waisted neck and tall spreading foot, the body with classic lotus scrolls repeated around the foot, within narrow bands of foliage, mounted at the shoulder with twin taotie-mask handles suspending loose rings. 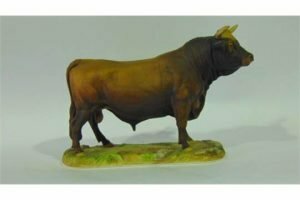 A Coalport matt glazed limited edition model of a Jersey bull standing on an oval base, with printed mark to base. 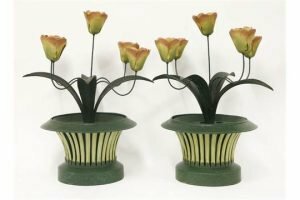 A pair of tôle peinte tulip vase centrepieces, each lift-out centre with five floral candle sconces over a reservoir with a pierced cover, standing within a basket. 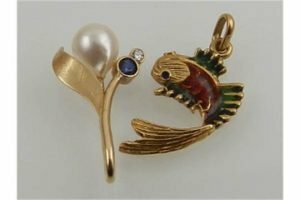 A yellow metal and enamelled pendant in the form of a colourful fish, the suspension loop stamped 750, together with a yellow metal pearl, sapphire, and diamond set pendant. 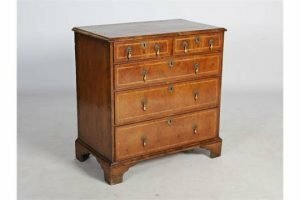 An 18th century walnut chest, the rectangular top with herringbone inlaid border and moulded edge, above two short and three long graduated cockbeaded drawers, raised on bracket feet.